Its native habitat is in the rugged wooded hills and mountain slopes of temperate to sub-alpine forests up to treeline between elevations of 2500 and 5200m. 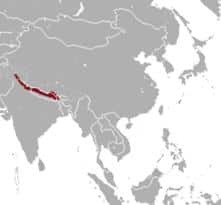 They are found in the Himalayas including China, North India and Nepal. Himalayan Tahr have been introduced to New Zealand and the Western Cape Province of South Africa. The dense, woolly winter coat is reddish to dark brown with a thick undercoat. With their winter coat, males grow a long, shaggy mane around the neck and shoulders which extends down the front legs. After the spring molt, the coat is much shorter and lighter in colour. The legs are relatively short, and the head is proportionally small. The eyes are large and the ears are small and pointed. The horns are triangular in cross-section and are found in both sexes. They curve upward, backwards, and then inwards, to a maximum length of 45cm, and are usually larger in males. Males can reach a height of 140cm and a weight of 90kgs with females being slightly smaller. The Himalayan Tahr has become a pest in New Zealand so much that it is legal and encouraged to hunt them. Diet: The Tahr will eat almost any vegetation, from grass and herbs to the leaves of shrubs and trees. They will rear up on their hind legs to reach for branches which they then hold down with their front legs as they eat. 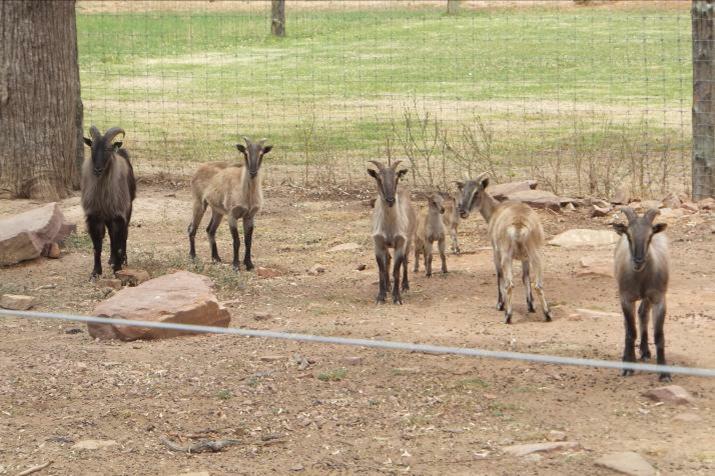 Group Structure: In winter they form mixed herds of 15 to 80 individuals. In spring males form bachelor groups before joining the females again in the autumn. Males fight for the right to breed with females. They raise their manes and expose their horns to intimidate their competitors. When this fails they clash horns and ‘wrestle’ to establish dominance. 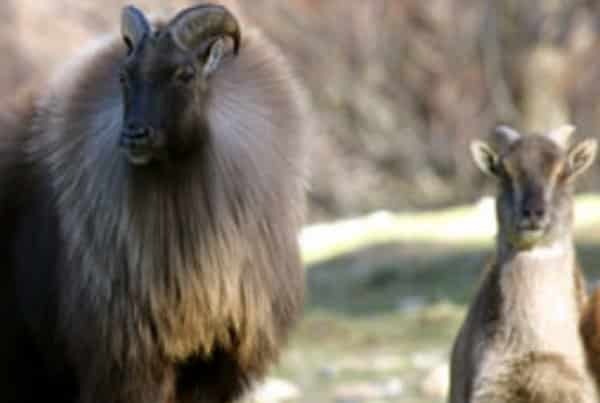 Reproduction: Tahr become sexually mature at 2-3 years of age, they are polygamous (meaning they have more than 1 mate). After a gestation period of 7 months, one offspring is born although in some instances twins can occur. Their hooves have a flexible, rubbery core that allows it to grip smooth rocks, while a hard, sharp rim can lodge into small footholds. 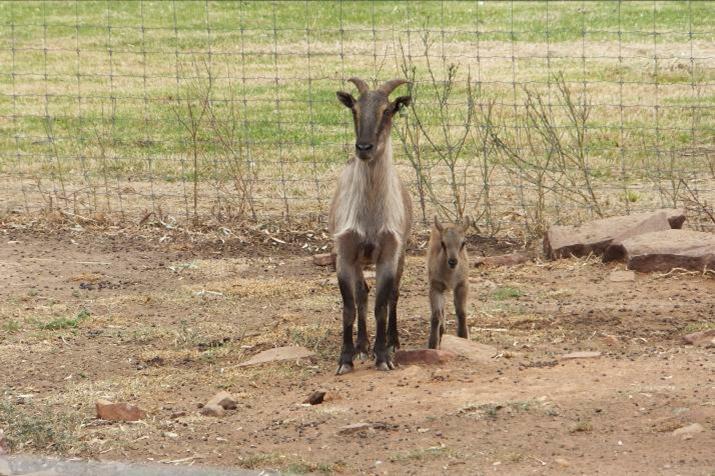 They are the closest relative to the wild goat. The Tahr is a ruminant and has a multi-chambered stomach. After feeding it needs to regurgitate the pulp and chew it over again. This allows it to get the maximum nutrition out of the tough vegetation it eats.